The weekend before Orientation week at the Seminary started, I was keen to take my family to one of the many amazing sites/amusement parks that are available to us in Southern California. You can imagine that from the moment we touched down at LAX,the girls had but a few words on their lips (Disneyland, Universal Studios, Magic Mountain). They were itching to go to at least one of them. We had worked hard over the previous 4 weeks to set up our house and the girls were amazingly patient while we did this, so I wanted to at least reward their patience. 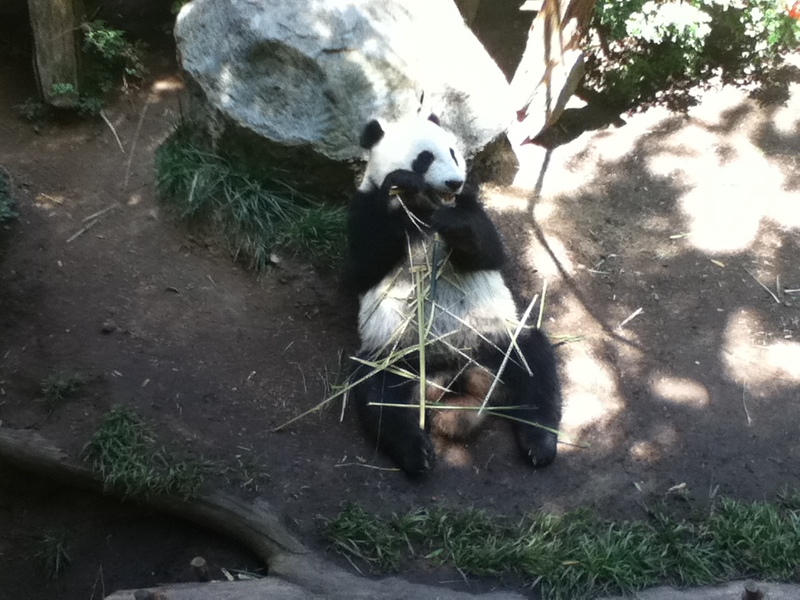 We were keen for a drive, so we decided to head south and go to the San Diego zoo. I heard it was a 2 hour drive (approximately 150 miles), and from looking at the map, it looked as though it would be a nice scenic coastal drive once we got past L.A. The drive was largely uninspiring and quite frankly, pretty boring. We left at 7AM and took the number 5 freeway to San Diego – a concrete, 5-6 lane freeway all the way. Barely any coast spotted at all. It took us a little under two and a half hours to get there. It was a Saturday and the zoo was very busy. I am glad that we had thought to buy our tickets online and print them out the night before. This saved us from having to stand in line to buy tickets. With the pre-bought tickets, we could bypass this considerable queue and walk right in. As tiresome as the drive was, this was contrasted sharply by the buzz and the excitement of the San Diego Zoo. We started by taking a guided bus tour on one of the open double-decker buses. The bus tour took about 30 minutes, travelled around most of the zoo exhibits and enabled us to get a fair idea of what there is to see. And there was a LOT to see. There was so many amazing animals and their enclosures were world-class and well laid out. Pandas in the flesh. They were quite close to the viewing gallery and looked very content munching on bamboo in front of hordes of people. It is difficult to not marvel at the imagination and the creativeness of the most wonderful God we serve when you witness animals like this. 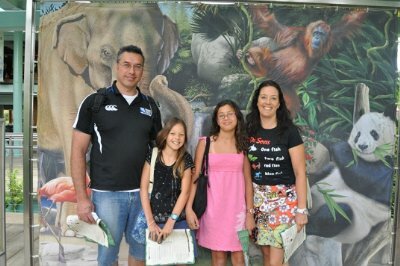 I normally love to watch the big cats (Tigers are my particular favourite), but Denise and I loved the polar bears. There are two levels in which to view them: from on top or from under the ground where you can view them under the water. Apparantly, the polar bears are not always so active, but when we got there, they were marvelously active. They frolicked about playfully in the water, amusing themselves with balls and other ‘toys’ they had. We were treated to a wonderful display and felt privileged to be there. The other highlight of the zoo trip was the ‘Skyfari’ which is an aerial gondola. The Skyfari stretched from one end of the zoo to the other. It travelled high above the tree-tops of the zoo and gave us tremendous views. It was a thrilling ride which the girls enjoyed immensely. The Skyfari and the tour bus were covered by our entry ticket which was helpful. It took us over 10 hours to get around the zoo, which is testament to the quality of the zoo as it could keep us captivated for so long. We just had a mere three hour drive home to look forward to. Take care my friends, and, all the very best for the start of Seminary Mark…well orientation anyway. Sarah went to Victoria University open day on Friday – she hopes to start there next year. Exciting stuff. Plus, she got her ‘full’ car license today – happy girl. Thanks for the newsy update.